35% of all international students enrolled at German universities are seeking a Bachelor degree. 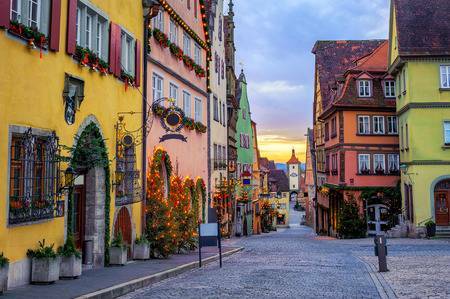 It’s not hard to see why Bachelor’s study programs in Germany enjoy this unmatched popularity. A German bachelor degree will equip you with a strong theoretical and practical understanding of your professional field open doors toward your future career and academic pathway. To apply for a Bachelor’s degree in Germany you need a detailed step-by-step guide. First, you need to decide what bachelor’s program is ideal for you and at what university you would like to study. In Germany, there are a lot of universities and study programs available for international students covering a wide range of subjects. The structure and study modules of these courses are freely accessible to incoming students so you can compare your studying preference with their Bachelor programs. The former will indicate to a large degree the overall cost of your studies and your further educational career. If your university is located in a big city then it will influence the total cost of living in Germany as a foreign student. On the other hand, if you’re an ambitious and highly skilled student, you may prefer to narrow down the list of universities to only the most reputed ones. Second, your understanding of the course content will remove the doubts you may have about what you want to study and will help you decide which course would suit your desires. There may be courses offered in your professional field, but its curriculum may not perfectly fit your academic goals. For instance, the study modules of your chosen course may cover every subject you’re willing to learn, but you’re more interested to carry on more practical sessions while the course contains limited experiments. After you have made up your mind to seek a degree in a specific Bachelor program you must now see what are the entry requirements. For this purpose, you must visit the university website. Usually, every university’s website has a particular section where application requirements are explained in details. Keep in mind that this stage is very important because every minor detail counts. During this stage, your application process starts for real and small errors can cost with a failed application in the end. To avoid this it is always to take as much time as required to precisely understand all requirements. And in case there is something unclear you must contact the university right away to seek guidance. The absolute majority of Bachelor programs at German universities are taught in the German language. Therefore, in order to be admitted you need to show excellent proficiency in the German language. Usually, you can prove your language proficiency by submitting a German language standardized test. The level of language required, changes depending on your course and the standardized test you have undertaken. For example, a C2 certificate from Goethe Institute would be acceptable from universities. Note that some universities may depart from this golden rule and may admit you under the condition you will undergo a German language preparatory course before starting the regular course. But if you don’t want to lose time to yourself and move directly to your regular course (which normally should be your first option) we suggest you learn German before you come to study in Germany. Furthermore, you must learn the German language even if your course is taught in English because you will be having conversations in the German language with locals while you’re living there. Non-EU and non-EEA international students need a German student visa to study in Germany and are required to have enough financial means to study in Germany to handle the cost of studying and living. 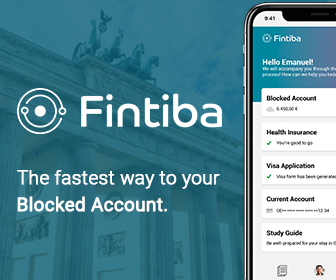 As of this year, you must have a minimum of €8,640 in a blocked bank account to be issued a student visa. This is a lot of money for a normal student, therefore, you must face this concern a long time ago, before the time to make an application it comes. It is preferable you start saving money at least four to six months before student visa application. During that time you can also seek financial resources for international students in Germany, whose number is fortunately large enough. After you have collected all documents required for an application and have gone through checking them several times, it’s time to apply for your favourite study course. The majority of German universities participate in the online application platform UniAssist.de but there are few others which run their own platform. Moreover, some universities may require you to apply online on their website alongside your submission in UniAssist. Since it entirely depends on the university’s own application policies you must contact them and see in what ways you can run your application. Once the university confirms it has received an application from you, sit back and wait. At this point, you have no other option rather being patient. As you would expect, German universities collect a large number of applications from resident and foreign applicants and the processing of your application takes time. Usually, it depends on the applications load of your university. Highly reputed universities receive a large number of applications and therefore application processing takes time. A missing document in your application can also account for additional admission delays. 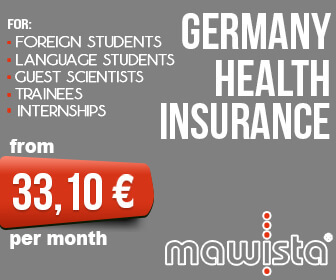 Health insurance in Germany for international students is mandatory. You must seek to get health insurance in Germany once you receive the admission letter from your university. There are two types of health insurance you can choose among in Germany: public and private. Remember that while being health insured is mandatory, you’re free to decide which type of insurance and which provider you want to choose. Finally, you’ve entered the final stage of your application for a Bachelor’s program in Germany. Citizens of countries rather than the EU and EEA must get a visa to study in Germany. To find out if you need to apply and what are the documents you need to collect in order to apply for a visa to get a bachelor degree in Germany, please read our article “Germany Student Visa Requirements, Fees and Application Process“! It is also important you start the whole process at least three months before commencing your studies because the embassy is not concerned about the time when your course will begin.